Millions of procedures, surgical and non-surgical, are performed around the world each year. 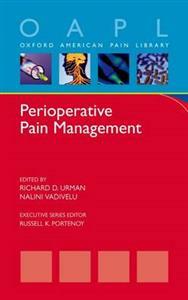 Management of perioperative pain is of great importance to patients, and a critical management issue for physicians and other health professionals who provide perioperative care. Healthcare facilities and national accrediting organizations have established standards surrounding proper management of perioperative pain. There is now an increased burden on every hospital and training program to ensure that healthcare providers understand the essentials of pain management and are able to recognize and treat pain in a timely fashion. Poorly controlled pain leads to patient dissatisfaction and contributes to increased morbidity and mortality, such as myocardial infarction, pneumonia, and emotional effects. Proper management, including appropriate pharmacologic management and regional analgesic techniques, can improve function and shorten length of hospital stay. Patients who are undergoing procedures under sedation or anesthesia need to receive adequate pain relief with drugs or regional anesthetic techniques. In the recovery room following the procedure, the staff taking care of the patient needs to be properly trained to diagnose and treat post-procedural pain. Part of the Oxford American Pain Library, this concise, evidence-based clinical guide serves as a tool for every clinician who wishes to understand the basic mechanisms, pharmacology, invasive and noninvasive treatment modalities, guidelines and development of pain management protocols. The authors address new technologies, chronic pain issues, running an acute pain service, opioid and non-opioid pharmacology (including newly approved drugs), epidural and other regional anesthesia, and special populations such as pediatric patients, the elderly, and patients with a co-existing disease.